Weekend Coffee Share: It’s Cold Out There! If we were having coffee, I would quickly pull you in out from the cold. On Friday the temperatures began to drop and some snow fell. The temperature continued spiralling downward yesterday while more flurries fell from the sky. This morning I woke to beautiful blue skies (it has been a while since we have seen the sun) and painfully cold winds. Brrr! Now I know it is January when I step outside and I hurry back indoors as fast as I can. My walks are hampered a bit by the snow, but I am not strolling and enjoying the outdoors! If we were having coffee, I would tell you that on Friday it was a PA day – which meant that the children did not come to school. The day was set aside for teachers to work on the Term 1 report cards. I had prepared well for this day and was ready to sit in front of my computer and input grades and work on comments. I am happy to say that my report cards are 98% done. All I need to do now is input a last few remaining grades once I have confirmed what they are. If we were having coffee, I would tell you that I participated in my first blog tour. It was an interesting project to participate in even though I did not get many visitors. I will do another one in the future but the next time I will be a bit more choosy with the book I choose to host. I did not enjoy reading the book featured in the tour too much so it made the exercise too much like work. If we were having coffee, I would tell you that my husband and I decided to go and see a movie on Tuesday night. We chose to see Bohemian Rhapsody as I love Queen’s music. It was an interesting film and so well made – I am not surprised that Rami Malek received a golden Globe for his performance. The film was long but neither my husband nor I felt the time passing. The show ended late and, because my mind was filled with Queen’s music when my head touched the pillow that night, I did not get to sleep much. As expected, I was tired the next day – but it was worth it. If we were having coffee, I would tell you that I am going to spend the rest of the afternoon snuggled up and reading. It is too cold to go out again and the few things I need I will purchase tomorrow while I am out. I hope that it is not too cold where you are. We are keeping ourselves inside as much as possible. Tomorrow is MLK day but will barely break the 2 digit mark. Stay warm. I would tell you that my wife and I also saw a film – but I don’t want to say which one because it is acclaimed – and boring, ponderous and pointless! 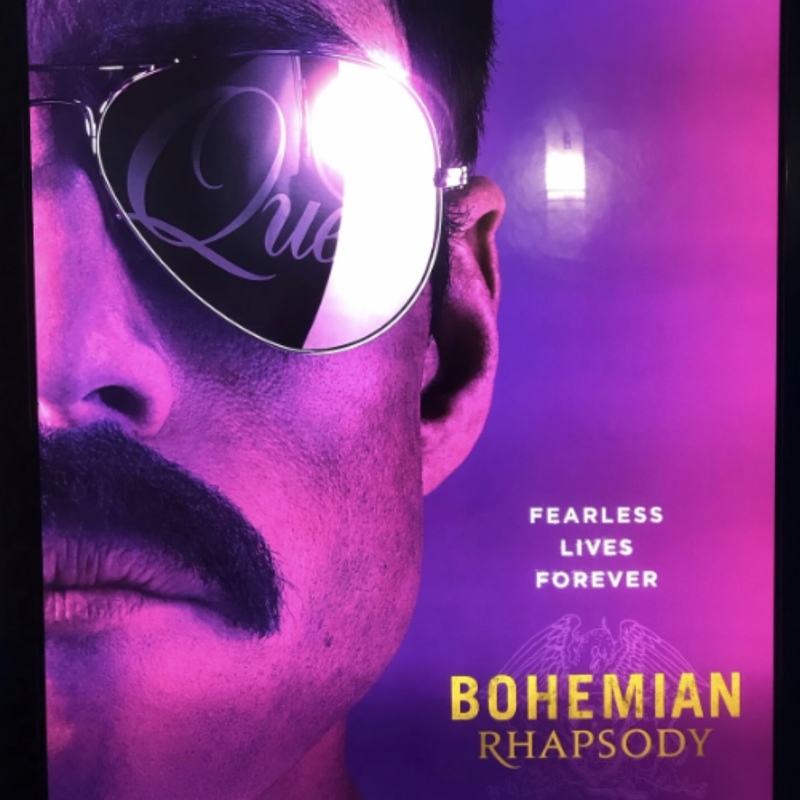 Oh well, we loved “Bohemian Rhapsody” and thought Rami Malek did a terrific job as Freddie Mercury – we saw it at a screening where Malek did a one hour interview afterwards and we heard what into doing the role – fun! Now that would be interesting – to hear the actor speak about his experience. Did he admire Freddie Mercury at all? Now I am curious to know the movie. Please tell me so that I can give it a miss! I think sometimes it has to be given the length of a film as well as the general audience. My wife and I saw “Bohemian Rhapsody” over the weekend and loved it! There is so much to love in that film! The temperatures have dropped even more today and it is currently-33c. We definitely will not be spending a lot of time outside! If you enjoy Queen’s music, you should definitely watch the film. Hi Colline. It is warmer here in northern California, but this state is more nuts that many other places. I’m glad you are safe and able to snuggle down with good books – because that is such a wonderful way to spend a day off. Then let’s really have coffee one day, Colline! My best to you. Happy Family Day! Thank you so much. It snowed some more during the night so it is a little chilly outside. I hear we’re in for even more snow tomorrow. Sigh! The winter never seems to end. Stay safe!